All House Calendars are in Adobe Acrobat .pdf Format. Select the Month and Year to display the beginning month, in four month increments, in the calendar below. 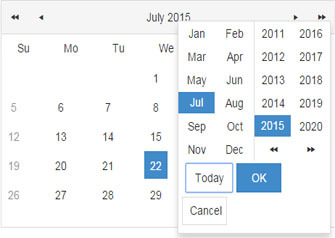 If any of those dates have a House General Calendar associated with it you will see the day underlined and clicking on the day will display the House General Calendar for that day in Adobe .PDF format. The House General Calendar is created in the Chief Clerk's office by the Calendar Clerk. This document is published each legislative day after the Chief Clerk's Office closes its desk for legislative business. The House General Calendar is updated daily and begins by listing the persons serving as the Doctor of the Day, the Nurse of the Day, Psychologist of the Day, the Chaplain of the Day or Week, etc. The House Calendar also contains notice of which committee meetings are scheduled on that particular day. Additionally, the House General Calendar lists what bills currently reside on General Order, meaning which bills and joint resolutions have been reported out of the standing committees. While this means that these bills are available to be scheduled for consideration by the full House, it does not necessarily mean these bills will be scheduled for a hearing on the House Floor. It also lists bills on Second Reading and resolutions for consideration, Senate Amendments received, requests for conference, what is in conference, Conference Committee Reports submitted, vetoes, etc.